JADE 0.1.0 is far from a complete game. It's more of a technology study that hints at what JADE might become. JADE 0.1.0 is lacking many things, a working skill system, a useful range of monsters, enough items and other things among that list. But as I blogged in the ADOM blog: For me this is a very important milestone as JADE 0.1.0 marks the point where I am going to switch from being afraid/bored/uninterested in all the infrastructure stuff required for some kind of release to actually being able to release new JADE versions early and often (as now I have reached a point that allows me to release a new version of JADE in less than 20 minutes - blog post including). Compare that to ADOM where a release took hours and you will recognize the advantage and potential of much smaller and faster release cycles. About 70% of the JADE development time will be used for content in the game itself. About 25% of the time will be used for enhancing the user interface (e.g. there are a lot of dialogs that do not use the ASCII theme - they will be replaced bit by bit). About 5% of the time will be used for infrastructural development (release optimizations, etc.). When you now consider the fact that an hour of work in JADE (adding new features, etc.) is about as productive as 20 hours spent working on new features in ADOM you hopefully also will understand why I nowadays am more interested in JADE than ADOM. And what are the goals for the next releases? The road towards 0.2.0 will be used to transform JADE into a game that will be somewhat nice to play. Still for fighters only. But this entails adding lots of monsters and items, making the skills work, etc. so this is an important goal. Till 0.3.0 a first bunch of new professions (e.g. the fighting ones like monk, barbarian, ...) will be added in order to get more variance. This pattern will continue for 0.4.0, 0.5.0 and so on by adding related professions that bring with them major new features (e.g. professions specialized on missile weapons, professions specialized on religion, professions specialized on spell casting, ...). New races will be added whenever I feel like it. And new features will be added all the time. Right now I plan to release a new version every one to four weeks in order to get early feedback. We'll see how this works out. 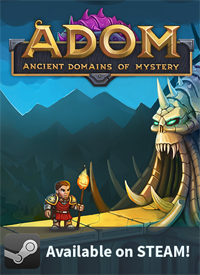 It's amazing that ADOM postcards keep coming. I'm curious to see if there will be JADE postcards... see the new address in JADE (although the ADOM address also continues to work). It's fun to see how the world has changed. When ADOM started the Internet almost didn't exist and Usenet still was the star of the day. Nowadays Usenet is almost forgotten and the World Wide Web rules. It's fun to see how our culture has changed. When ADOM had it's best days, I still was a pretty mysterious person, there were no pictures and it was hard to find anything about me. Nowadays we have Facebook, Twitter, Xing, LinkedIn and so much other stuff - there are very few secrets left (which I sometimes find a bad thing). I expected JADE to be years in the making... but never would I have guessed that it would take 13 years to publish a first rudimentary version. A lot of stuff happened in that time (I founded a company, I married, I started finished my Ph. D. while working full time as a CEO, I bought a house and lots of other things) but the love for JADE and ADOM still burns in my heart. So now I really will try to push the game forward. Wish me luck. Ok, what else to say? Donations to support JADE are extremely welcome. I could use a new computer for development and a gardener would help quite a bit in protecting me from having to spend so much time of my weekends with our garden (time which could be put to much better use working on JADE). Use the JADE forum to let me know what you think about the initial release. BTW, I have reopened the forums for everyone. 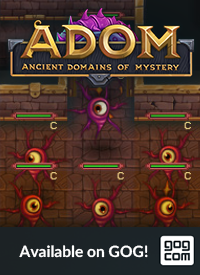 I am working on a solution for spambots by getting support from other ADOM & JADE enthusiasts to help me but this will have to wait another day or two. Use the JADE project management tool to report bugs and propose new features. Become a follower of this blog (button to the right). 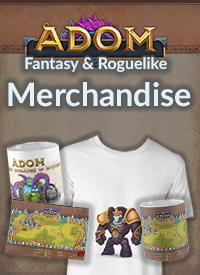 Befriend me on Facebook - I love to meet ADOM & JADE enthusiasts. Thus any of LiveJournal bloggers may just add rss_jade_blog to friends in order to receive further JADE updates. I am happy to be able to finally see JADE!! Finally! Thanks for the diligent work, and building a well architected product! thanks! :D great to finally see some of jade! And more to come soon... in much faster intervals than in the past. Promised! Also, Thomas has a bridge he would like to sell you. Thank you Thomas!! I just had to explain to my mom why I am so excited and I think she got it... suffice to say. SO EXITED!! !